The Dean Martin Celebrity Roasts were comedy shows on NBC that began as one hour special episodes on the Dean Martin Show during its final season. Starting the following 1975-1976 season and continuing through the 1983-1984 season, this "spinoff series" roasted numerous big name TV and movie stars on special broadcasts utilizing a two hour format. The Roastees were subjected to one embarrasing joke after another from Dean and a panel of roasters for most of the show but then got their chance to get back at the roasters in the end. Hank Aaron, Muhammad Ali, Lucille Ball, Jack Benny, George Burns, Truman Capote, Johnny Carson, Wilt Chamberlain, Joan Collins, William Conrad, Bette Davis, Sammy Davis Jr., Angie Dickinson, Kirk Douglas, Leo Durocher, Red Foxx, Zsa Zsa Gabor, Joe Garagiola, Jackie Gleason, Barry Goldwater, Dan Haggerty, Monty Hall, Valerie Harper, Hugh Hefner, Bob Hope, Hubert Humphrey, Gabe Kaplan, Jack Klugman, Evel Knievel, Ted Knight, Michael Landon, Mr. T, Peter Marshall, Dean Martin, Ed McMahon, Ralph Nader, Joe Namath, Carroll O'Connor, Ronald Reagan, Don Rickles, Bobby Riggs, Rowan & Martin, Telly Savalas, Frank Sinatra, Suzanne Somers, Jimmy Stewart, Danny Thomas, George Washington, Dennis Weaver and Betty White. The Roastees were also referred to as "Man of the Hour" or "Woman of the Hour". 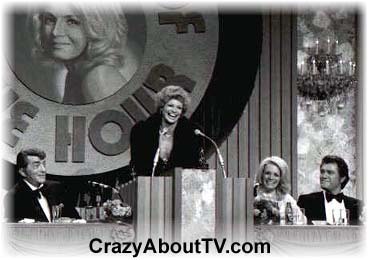 The Dean Martin Celebrity Roasts aired on Thursday evenings. They were filmed in the Ziegfeld Room at the MGM Grand Hotel in Las Vegas, Nevada. Roasts were originally conceived as "spoofs" of testimonial dinners. Instead of family, friends, and co-workers getting up in front of a crowd and heralding the man or woman being honored, roasters concentrate on the person's shortcomings. Often a roastee would act as if they were very upset about something being said but it almost always was just an act and in good fun. It was also extremely funny for fans to watch! The jibes were typically true to life so it's amazing that more roastees didn't get upset. If the roastee had a reputation of drinking, drugs, womanizing, gambling, being obese, being stupid, or anything else like that, you can be sure they heard about it during their roast! For example, Dean Martin said that Johnny Carson was a farm boy from Nebraska and he knew that because he saw him earlier in the bar with a couple of pigs! Many celebrities that were never roasted served as regular roasters. Many of them were there because they had a close relationship with the roastee. One of the best examples of that is when sportscaster Howard Cosell appeared on the Muhammad Ali roast. There were also regular roasters who tended to be the celebrities that were comedians who excelled at making the roastees' life miserable! Some of those included Milton Berle ("Texaco Star Theater"), Foster Brooks, Ruth Buzzi ("Rowan & Martin's Laugh-In"), Dom DeLuise ("The Dom DeLuise Show"), Phyllis Diller ("The Pruitts Of Southampton"), and Rich Little ("Love on a Rooftop"). Several of the Dean Martin Celebrity Roasts have been sold for years on video tape and are now available on dvd. Comedian Rich Little hosted a bunch of very entertaining infomercials for them. Thank you for visiting our Dean Martin Celebrity Roasts page!